Skip the Apps & Get Your Own Personal Electric Scooter for Free! While cities grapple with how to regulate electric scooter ride-sharing, you can skip the app scanning and ride fees with your very own personal electric scooter — absolutely free. 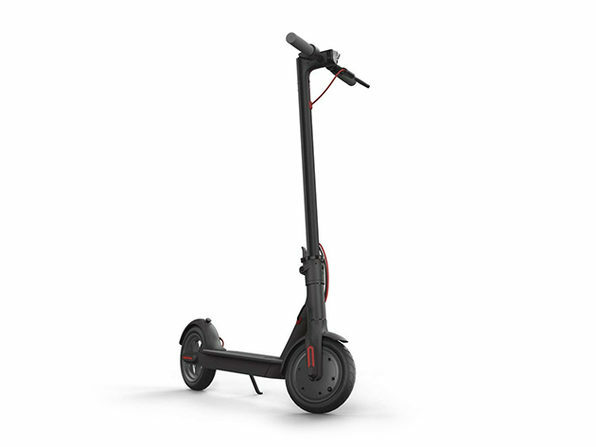 The Xiaomi Mi Electric Scooter features a 250W motor and a max speed of 15.5 MPH with an 18.6 mile range. Maybe that's enough range to get you all the way to work. It's probably enough to get you to the local cafe and back for a snack, at the very least. The portable folding design allows for easy storage at home or carrying with you indoors. Intuitive controls simplify learning how to ride for all ages and ensure you're never caught out of control. It's not wonder why the Mi is a Red Dot Design "Best of the Best" Award as well as an iF Design Award. Enter to win a Xiaomi Mi today and take advantage of the transportation of the future! Xiaomi is not affiliated with this contest. This promotion is in no way sponsored, endorsed or administered by, or associated with, Facebook. You are providing your information to StackCommerce, Inc. and not to Facebook. 1. Eligibility. Subject to the additional restrictions below, the StackCommerce The Xiaomi Mi Electric Scooter Giveaway Sweepstakes (“Sweepstakes”) is open to all legal residents of the United States who are eighteen (18) years of age or older as of the date of entry. For purposes of these Official Rules, all times are Pacific Standard Time (PST). Employees or agents of StackCommerce, Inc. (“StackCommerce”) and co-sponsors of the Sweepstakes (if any) and their respective affiliates, subsidiaries, advertising/promotional agencies, and the members of their immediate families (i.e. parents, children, siblings or spouse) or those persons living in the same household of such individuals are ineligible to enter or win. The Sweepstakes is subject to all applicable federal, state and local laws and regulations. Void where prohibited by law. Participation constitutes entrant’s full and unconditional agreement to these Official Rules, any terms that apply to your use of Facebook’s policies and procedures (to the extent you seek Additional Entry per below) and any other terms that apply to your use of Facebook and Sponsor’s decisions, which are final and binding in all matters related to the Sweepstakes. Winning a prize is contingent upon fulfilling the eligibility requirements set forth above and below. 3. Sweepstakes Term. The Sweepstakes will end at 11:59 PM PDT on 09/15/18 (the “Sweepstakes Term”). Sponsor’s computer is the official time keeping device for the Sweepstakes. 5. Prizes & Approximate Retail Value. A total of $499 prizes will be awarded to winners selected at random. One Grand Prize is available, to be given away. The Grand Prize consists of: a Xiaomi Mi Electric Scooter with an approximate retail value (“ARV”) of $499. StackCommerce’s decisions as to the administration and operation of the Sweepstakes and the selection of the potential winner are final and binding in all matters related to the Sweepstakes. The potential winner will be notified immediately via email or through Facebook. The award of prizes exceeding a retail value of $600 is subject to applicable withholding requirements and the winner will receive an IRS Form 1099 reflecting the actual final retail value of the prize. Where permitted by law, the potential winner will be required to sign and return to Sponsor(s), within seven (7) business days of the date the notice is sent, an affidavit of eligibility and liability/publicity in order to claim their prize. If a potential winner cannot be contacted or fails to sign and return the affidavit of eligibility and liability/publicity release within the required time period, the potential winner forfeits the prize, unless prohibited by law. Receipt of a prize by a potential winner is contingent upon fulfilling all requirements described herein. The winners must continue to comply with all terms and conditions of these Official Rules after prize notification. In the event that a potential winner is disqualified for any reason, StackCommerce will award the applicable prize to an alternate winner by random drawing held by Sponsor from among all remaining eligible entries received during the Sweepstakes Term. Prizes may not be transferred or assigned except with Sponsor’s written consent. 14. Winner List. For a copy of the name of the winner(s), available after 11:59 PM PDT on 09/15/18 + 1 month, 2018, or a copy of these Official Rules, send a self-addressed, stamped envelope to, StackCommerce, Inc., Attn: “Winner List/Official Rules” for The Xiaomi Mi Electric Scooter Giveaway 21 Market Street, Los Angeles, California 90291.